For the first time, it’s something actually very frightening for Halloween…I don’t think we’ve done anything this scary before. Who doesn’t love a good roller coaster? Who especially doesn’t love a good roller coaster in the dark with multimedia effects? For the second year now, Disneyland (along with the rest of the Disney Parks family) has added a spooky overlay for their HalloweenTime celebration during the month of October. Now, there’s only a couple more days until All Hallow’s Eve, but for those of you who may not have a chance to visit their nearest Disney theme park, I’ll give you a little taste of the action. One of four ghastly projections on the exterior of Space Mountain. 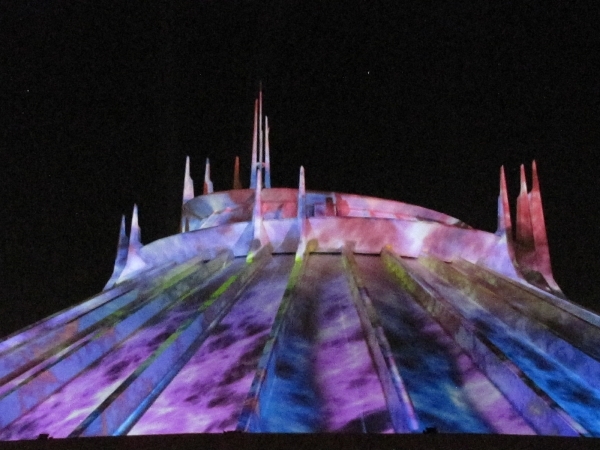 Ghost Galaxy is probably best experienced at night when the projections on the Space Mountain dome can be seen. Monstrous roaring, gnashing, and clawing periodically emanates from the Mountain, as if there is something big inside trying to get out. Disney does a fantastic job of communicating the feel of the ride from the moment you walk past the entrance. Normally, the Mountain is quiet, unassuming, but for HalloweenTime, you know as soon as you enter Tomorrowland that something is wrong. The story, from what I can infer from the themeing is that SpacePort 77 (as the entrance to Space Mountain is known) has been experiencing some odd readings from one of its planetary probes: eerie clouds in space followed by extreme interference and a loss of signal (riders can watch the playback on the large screen in the spaceport section of the pre-show queue). As crew of SM77 (your mission designation), it is the riders’ task to investigate the phenomenon and report back to your commander. Meet the Nebula Ghost, a paranormal entity that has invaded your galaxy and the source of all the interference back at SpacePort 77. It’s big, it’s powerful, it’s scary, and it wants to eat you. The SM77 rocket you and your fellow astronauts are flying has no weapons systems (it was designed for relatively short-range, peaceful exploration and scouting), so your best option here is to run. And run you do. Fast. Down the familiar dips, twists, and turns that make up the Space Mountain track, but this time with a galaxy-eating, world-destroying, soul-sucking Nebula Ghost at your every turn! If you happen to make it back to SpacePort 77 in one piece, you will be rewarded with the option of purchasing a souvenir photo of your adventure. I would highly recommend it, as it’s only available for 1/12th of the year and it’s a really cool image mask. The best seats are in rows 3 and 4, as most of the action centers there. Sit in row 4 if you decide to go for the photo–you’re not as likely to be blocked by someone’s wayward arms or hands. Posted on October 27, 2011, in Entertainment, Reviews, Travel and tagged Disneyland, Halloween, roller coaster, Space Mountain, Tomorrowland. Bookmark the permalink. 3 Comments.